For the treatment of hormone-responsive urinary incontinence due to sphincter mechanism incompetence in female dogs. The active ingredient in Incurin, estriol, is a naturally occurring, short-acting estrogen. Estriol can help restore estrogen levels in spayed dogs to support a dog's natural processes for maintaining urethral tone for urinary control. It differs from most other estrogens because it binds with estrogen receptors for a short time. Adverse reactions are rare. Of reported reactions, vulvar swelling, attractiveness to male dogs, gastrointestinal signs, and localized or generalized hormonal pattern alopecia were the most common observations. The active ingredient in Incurin, estriol, is a naturally occurring, short-acting estrogen. Estriol can help restore estrogen levels in spayed dogs to support a dog’s natural processes for maintaining urethral tone for urinary control. 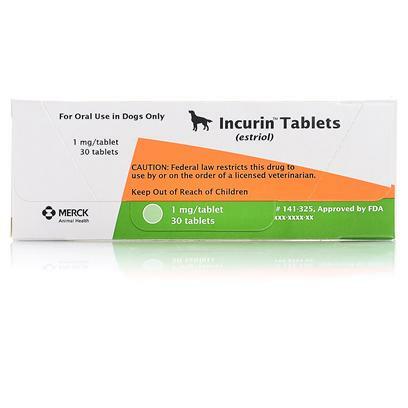 Incurin is intended for once daily oral administration. There is no relationship between the size of the dog and the dose required, so a fixed mg/kg dose rate is not feasible. Effectiveness is defined as no signs of incontinence for 7 consecutive days. An improvement will usually be noticed within a few days. However, adjustment of the initial dose will often be necessary, so at least 7 days should be allowed before judging the full effect of a certain dose rate. Initial dose: 1 tablet (1mg) per day for 7-14 days. If treatment is ineffective at the lower doses, titrate back to the next lowest dose. If treatment with 1mg daily is ineffective, increase the dose to 2mg daily for 7 days. (Maximum dose should not exceed 2mg/day). If effective, try reducing dose to 2mg on alternate days. However, if treatment with 2mg/day is ineffective, reassess case to confirm diagnosis, then consider supplementary therapy. Treatment will continue for the remainder of the life of the dog.